This year there’s a new streaming provider for the Pittsburgh Peregrine nestcams at the Cathedral of Learning and Gulf Tower. The video links are found on the National Aviary website with streaming provided by Ozolio. THE STREAM STOPS AFTER 5 MINUTES: Yes it does. Here’s how to restart it. If you see a Play button click on it to restart the stream (screenshot below). (using Windows) If the stream stops but doesn’t show a play button, press F5 to refresh the page. The stream will start again. If you cannot see the stream at all and your computer gives you the message below, click on the Activate Adobe Flash link to see the stream. If your browser screams at you that this might be dangerous, say yes anyway. Otherwise you can’t see the nest. Thanks for all the interesting information on the birds and nature. You probably know that WildEarth dropped their beta site so us Android people have had problems but Jellybean and Lollipop versions of Android w/new enough version of Adobe Flash Player to allow viewing of the web cams but the viewing of Videomarks sometimes is blocked. Older versions of Android operating system don’t open up the Wildearth web cams and to install newer versions of Adobe Flash player onto older Android platforms requires some “work around” software. Need some tech support/search to make it happen. This message was put up on WildEarths web site last November/December. John Thomson, thanks for the information. 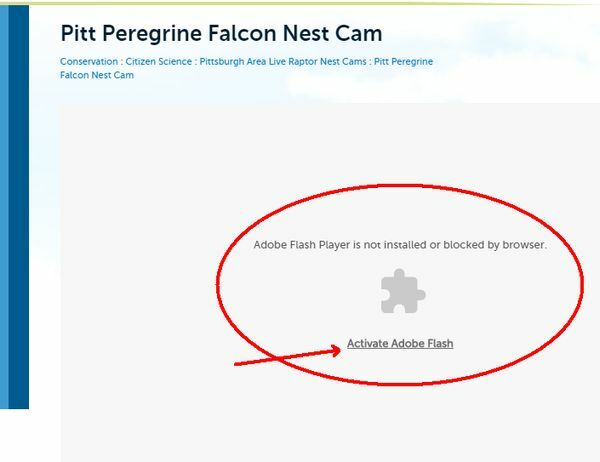 The National Aviary falconcams no longer stream at WildEarth. I saw a Falcon, I think it was a falcon, it was grey and white, and it was flying low, sitting on a big pine tree limb and then flew around the area..low. It was a bigger bird, but not as big as a hawk or eagle. I live in Fair Oaks, CA..near the Sacramento River. What kind of bird do you think it was?